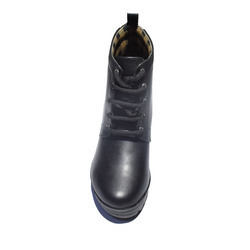 In order to meet excellent quality standards, we are supplying Moccasin Boot. The High Laced Brown Ankle Boot is a smart ankle boot with a lace-up front and contrast stitching. The high heel gives you extra height with a comfortable base. Backed by our experienced and seasoned craftsmen and designers, we manufacture a commendable range of designer shoes. These shoes are appreciated for their excellent design and smart fit. The designer shoes are widely worn during special occasions. 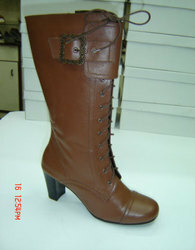 Moreover, we use top quality leather to offer these shoes that enhance its durability for sure.